Your home is one of the largest investments you’ll make, and whether you are looking to purchase a new home or you already have one, you want to be sure it remains structurally sound and safe. Termite inspections are a critical service if you do not want to share your home with these voracious menaces. At The Other Side Lawn & Ornamental Pest Control Inc., our termite inspections are completed by a certified technician with a trained eye. We can also provide you with tips to prevent termites. Here are some things you should know about why termite inspections are necessary and when to have them done. Termites are a Year-Round Problem – The Florida climate lets termites thrive unchecked, as there isn’t a winter hard freeze to reduce their numbers. We even have more swarm periods than other states and climates. 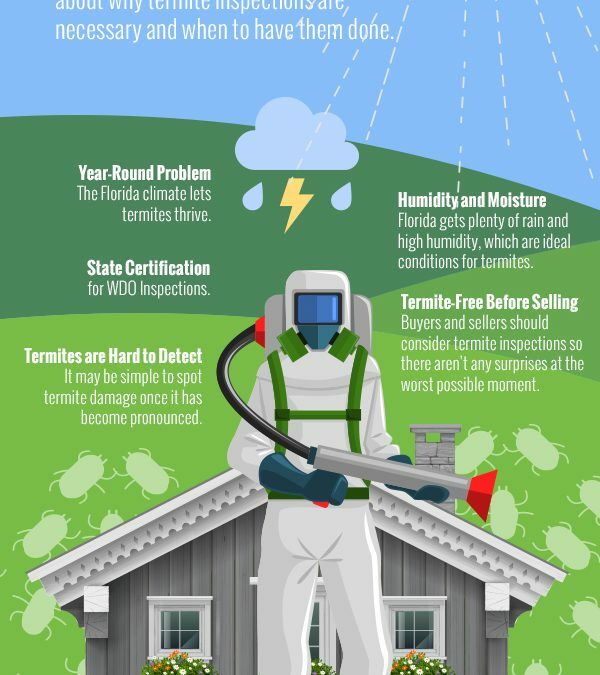 Termites Love the Florida Humidity and Moisture- We may not get snow here, but we see plenty of rain and high humidity, which are ideal conditions for termites. Termites are Hard to Detect- It may be simple to spot termite damage once it has become pronounced, but it takes a trained eye to spot it while it is less costly to repair the damage. Ensure Your Home is Termite-Free Before Selling- Buyers and sellers should consider termite inspections so there aren’t any surprises at the worst possible moment. Sellers can make their home more appealing by showing a termite report and buyers can be confident they are buying a home free of termites and termite damage. We Have State Certification for WDO Inspections- You should call on us for a termite inspection because a standard home inspector may not have the state certification for this specialized inspection.